Penn State’s Aerospace Studies Student Organization invites you to run and/or donate to the 2nd Annual Freedom 5k for PTSD on November 11, 2018. This event is a joint service supported philanthropic effort to raise money and awareness for PTS, one of the leading epidemics impacting our nation’s veterans. Our benefactor, Lone Survivor Foundation, provides support for wounded service members, their spouses, children, and care partners by empowering them with helpful techniques and tools addressing Post Traumatic Stress (PTS), mild Traumatic Brain Injury (mTBI), Chronic Pain, Military Sexual Trauma (MST), and Care Partner Stress. Lone Survivor Foundation restores, empowers, and renews hope for our wounded service members and their families through health, wellness and therapeutic support. Lone Survivor Foundation is a Federal 501(c)3 non-profit founded in 2010 by Navy SEAL (Ret.) Marcus Luttrell. Our goal is to raise at least $10,000 to fund an entire retreat hosted by Lone Survivor Foundation. The Freedom 5K also honors the spirit of Navy SEAL Lt. Michael Murphy, a Penn State Alumni, who made the ultimate sacrifice for his men as part of Operation Red Wings. 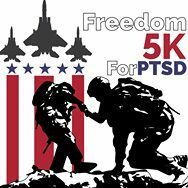 Please register to run or donate directly to the Freedom 5k For PTSD event.